TA Partners: Are you making Model Ts or faster horses? On December 1st, 1913, Henry Ford installed the first moving assembly line to mass produce entire automobiles, and began producing the Model T (1). On that day, he changed the world as consumers knew it. 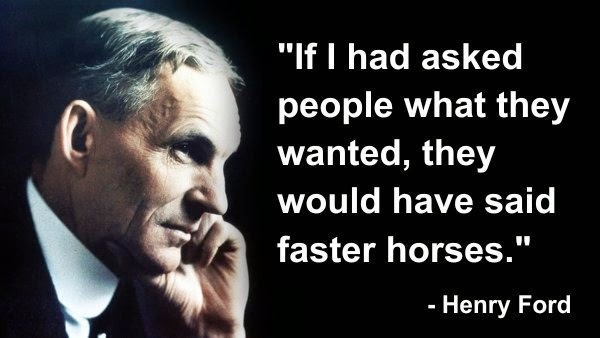 There are examples throughout history of companies and leaders who followed this same philosophy, and chose to make a “Model T” instead of a faster horse. What do these leaders and companies have in common? They all offered solutions to problems that people didn’t even know they had. Apple’s iPhone is one of the greatest modern examples of the Model T. The company has sold more than 500 million iPhones, and can be credited with over 50 billion (yes with a B) downloads from their App store (2). Can anyone out there imagine using their flip phones to send an email, edit a photo, or check a Facebook status? Yes, there were companies out there offering phones that served a market demand (BlackBerry), but Apple did something different – instead of improving upon technology of the time (a faster horse), they recreated the entire industry with that touch screen and the first iPhone. What followed was a number of other carriers who have been trying to catch up ever since. How are they doing it? Mostly by trying to make a “faster horse”. And Apple isn’t the only company to change the way consumers think about a product or service. Other companies who have impacted entire industries include Twitter, Instagram, Tesla, Strava, Zappos, Amazon, Patagonia, and Uber. These companies looked at what consumers were used to, and chose not to settle on building a faster horse. How are you different from other agents? What makes you stand out? Whatever it is, make sure that it provides real value to your client. If Henry Ford started breeding Zebras to pull carriages, he would have been different, but it’s safe to say that the Ford Motor Company would not be where it is today. Differentiate, but in a way that provides value and meaning to your clientele. All these companies had/have a leader behind it with a vision of something that could be greater. Great leaders in any industry have their own “Model T”. What’s yours? Subscribe to TA-Partners Blog Today!